Diana is available to fly her dazzling display routine at various kinds of events such as weddings, parties, corporate gatherings, sporting fixtures and of course airshows! An air display at your wedding reception or party will certainly make a longer lasting impression than a fireworks display - and at similar cost. Diana will display anywhere in the UK or Europe. If your venue is not at an airfield, there must be sufficient open space available, as aerobatics are not permitted over a built-up area. In the UK, authorisation must be obtained from the Civil Aviation Authority and the relevant charge paid. If your event is advertised and open to the public, a formal permission is required. For a non-public occasion, such as a wedding or other private gathering, a minimum height exemption is needed. In either case, you will need to provide Diana with an Ordnance Survey map, in order that she can mark out the display 'box' and apply on your behalf for the permission or exemption. Diana is authorised by the Civil Aviation Authority to fly displays down to 100' above ground level. Displays should be timed to finish one hour before sunset. If you have a special reason for requesting a later display, this can be considered subject to there being a local airfield with hangarage available. Third Party Liability of £2m is held, with Crown Indemnity of £7.5m. Fuel: up to 120L of Avgas 100LL to be provided by the organiser if the event is at an airfield. Hangarage: to be provided by the organiser if the event is more than 200nm from Fairoaks Airport, or if the display is required later than one hour before sunset. Hotel accommodation and meals to be provided by the organiser if the event is more than 200nm from Fairoaks Airport, or if the display is required later than one hour before sunset. Display appearances are subject to weather, and the pilot's decision is final. 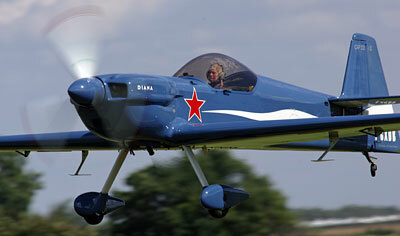 An individual quotation will be provided on request, to cover aircraft costs and incidental expenses. The relevant charge levied by the Civil Aviation Authority will be shown. Terms of payment will be included with the quotation. Please make contact well in advance, by 'phone or email, to check availability for your date, to discuss suitability of the proposed site, and to obtain a quotation.